A cow slaughtered by thieves before they take the meat away. 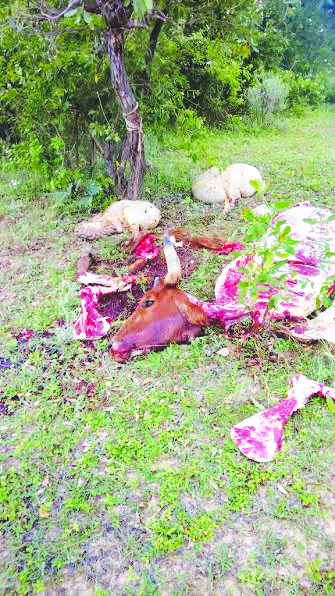 BUHERA – Three notorious stock thieves who stole cattle, slaughtered and skinned them for the meat before leaving the bones have been arrested and remanded in prison at Buhera Magistrates Courts. Feyani China (46) of Savanhu Village under Chief Seke, Tapiwa Mafaune of Garamwera Village under Chief Gwebu (39) and Joseph Makweche (..) of 5030, Northwood, Chivhu were caught at Gwebu bus stop in Buhera on Friday with sacks full of meat. 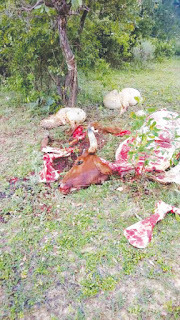 Cases where carcasses of cattle are left behind by stock thieves after skinning the meat have become common throughout the country and Buhera is no exception. Magistrate Kuhudzai denied the three bail. He said China and Makweche may flee since they are not Buhera residents and because the case against them is serious. He said Mafaune may interfere with witnesses and jeopardize evidence because he is a resident of the area where the crime was committed. It is the state case that on October 1, 2018 at Mundare Village under Chief Makumbe in Buhera, Mafaune and China went to Gwenzi’s kraal; stole one beast, slaughtered it and deboned and fled. China was found together with her accomplice, Elizabeth Kativhu who is still at large, in possession of 4 sacks of meat and a satchel at Gwebu Bus Stop. China was the first one to be arrested and she implicated Mafaune, Makweche and Kativhu who ran away from the scene. China told the Police that Mafaune was the one who had led them to the complainant’s kraal. Mafaune and China led the Police to Gwenzi’s kraal and to Marodzva farm where they slaughtered it and deboned it before packing the meat in sacks and a satchel. The value of the stolen beast is $800 and the deboned meat was all recovered. The matter was adjourned to November 7, 2018 for trial.